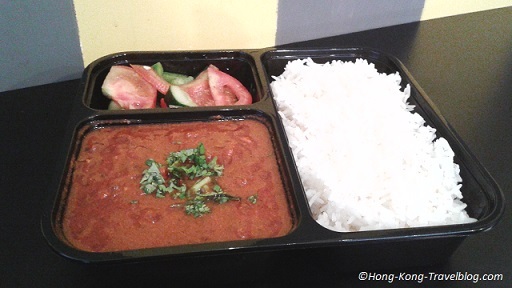 Have you ever tried any Indian food in Hong Kong? I was invited by the owner of Masala Train to try some. 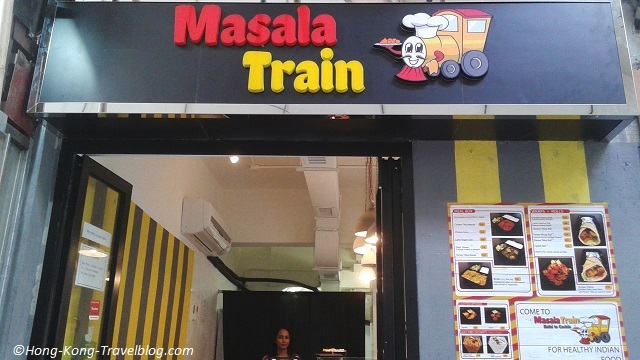 Whether you are a big fan of it or new to it, you would be impressed by Masala Train – a brand new Indian joint conveniently located in the heart of Wanchai, Hong Kong. Masala Train has a mission, it wants to promote the healthiness of Indian food. This generously priced causal eatery has its own features: the delicious traditional dishes are freshly homemade; they are rich in fibre and protein in a healthy way; no MSG, excess salt or artificial sweeteners. Their menu has four main categories, Meal Box, Wrap, Appetizer and Dessert, with over fifteen dishes in total. Of course, I could not try all of them at the same time. I did try my best to taste four of them and share with you about them. The comments below are based on the dishes I tried. Originated in the Punjab region (northern India) of the Indian subcontinent, it is one of the most famous Indian dishes in the world and therefore I tried it. The curry is creamy, spicy and orange in colour as usual. For those new to Indian food like me, see the explanations of the terms below. Tikka: small pieces of meat or vegetables marinated and then roasted. Masala: a mixture of ground spices (it is not a female name like Marcella, don’t get confused). The meal box was not as spicy as I thought at the first bite, but the curry soon warmed up my body after a few more bites. Luckily, there was some side salad to cool oneself down. The Verdict: The curry of the HKD 58 meal box is medium spicy, the rice is soft, the chicken is well-marinated and the salad is well-mixed. The filling of the wrap is spiced minced lamb and vegetables. The flatbread/tortilla is not thick, filled with enough meat and vegetables inside the roll. It is just HKD 68 and is delicious! This popular beverage is Indian milk tea with spices. It is smooth and creamy with a flavour of cinnamon and ginger etc. I think it worth more than HKD 12. The texture of it is a bit like latte or Hong Kong-style milk tea. All desserts in the house are gluten-free with zero sugar. This puree like dessert is made of grated carrot and a little bit of nuts. 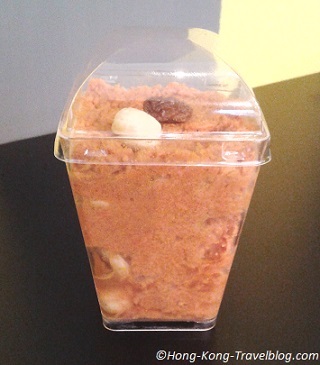 The sugar flavour is light and it comes naturally from minced dates. This HKD 25 dessert can give you a good balance after having spicy dishes. Having some spices is good for your health. Chicken Curry is milder than Chicken Tikka Masala. If you want the dishes to be milder, simply tell the team members when you make the order. They will take care of it. As I don’t usually have spicy food, they add fewer spices to my wrap. How considerate of the team! There are only 3-4 seats, so either go there early to catch a seat or have it as a takeaway. Other than meat, veggies choices are also available. Well, we now have better understanding of the food of Masala Train. How about the shop owner? Don’t worried. We have got it covered. Just keep on reading. Q: Can you share with us a little bit more about your background? Sure, I had worked in the banking industry for over 10 years and I worked in Hong Kong for several years. I have got an MBA from a prestige business school in India. This is the first time I start a business in the F&B industry. Q: Why did you start Masala Train? Q: What are your favourite cuisine other than Indian food? I like Sichuan cuisine and Korean BBQ. Q: People usually go to Chungking Mansions to have curry, what do you think? Our food is fresh and we pay more attention to hygiene. 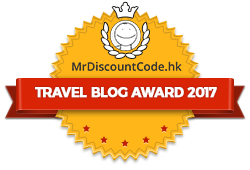 Q: What are your favourite Hong Kong attractions? Opening times: Monday to Thursday 11.30am to 9.30pm, and open until midnight on Friday and Saturday. Explore our Food & Drink section for more information. Feel free to leave us comments or contact us if you have any questions. You may also invite us to write a review for your restaurants and/or shops.